Today’s forecast will look ahead to some winter-like temperatures this week, and the possibility of some heavy rainfall and potential flooding later this week as a storm system moves through the Southern United States. 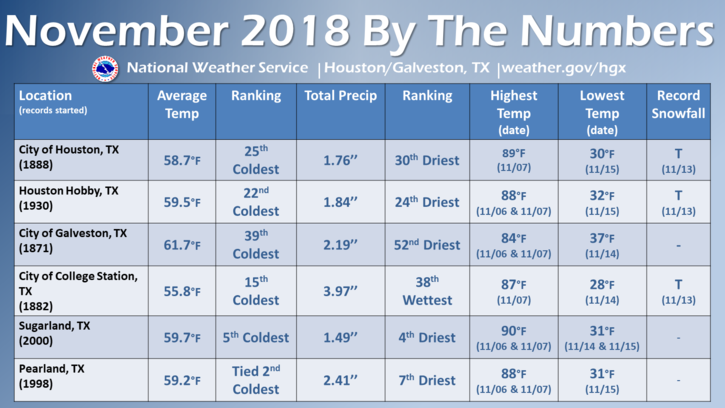 But before we get into December’s weather, here’s a quick look back at November, which for most of Houston was quite cold, and quite dry. Note that the Sugar Land and Pearland temperature rankings, while impressive, only reflect about 20 years of data. Northerly winds are bringing colder and drier air into Houston this morning, and conditions will remain so as high pressure establishes itself over the region. This will lead to a sunny day, with highs in the mid-60s, with some winds gusting above 20 mph. Temperatures will drop pretty quickly as the Sun goes down, with upper 30s possible for areas north of Houston, and low- to mid-40s for the rest of the metro area. More of the same. 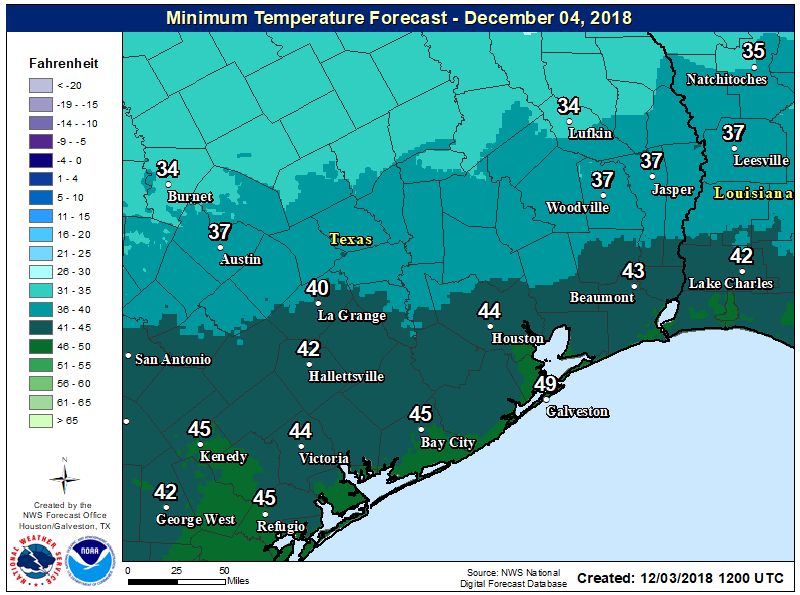 These will be classic, winter-like days for Houston, with partly to mostly sunny skies, highs of around 60 degrees, and lows ranging from the upper-30s for far inland areas to low 50s along the coast. A good time for sweaters and hot cocoa. The winter party will end fairly abruptly on Thursday, as the high pressure system moves off, and onshore winds come roaring back into the upper Texas coast. We’ll likely see the return of clouds, with highs reaching to near 70 degrees. This moisture return will be critical to supporting the potential for widespread rainfall to end the week. For several days, the global forecast models have been surprisingly consistent by highlighting the potential for storms along with the region’s next cold front, which should impact the greater Houston area on Friday into Saturday. This far out, there remains a fair amount of uncertainty, but the overall dynamics point to a fairly potent rainmaker of a low pressure system moving along with the front. The timing and location of this remains something of a question mark, but at this point I think it’s fair to say that Friday, Friday night, and possibly Saturday morning will all have the potential for heavy rainfall. Most of the eastern half of Texas seems likely to see between two and four inches of rainfall, with higher amounts in some areas. But will that be Lufkin, Houston, or Beaumont? Impossible to say for now. 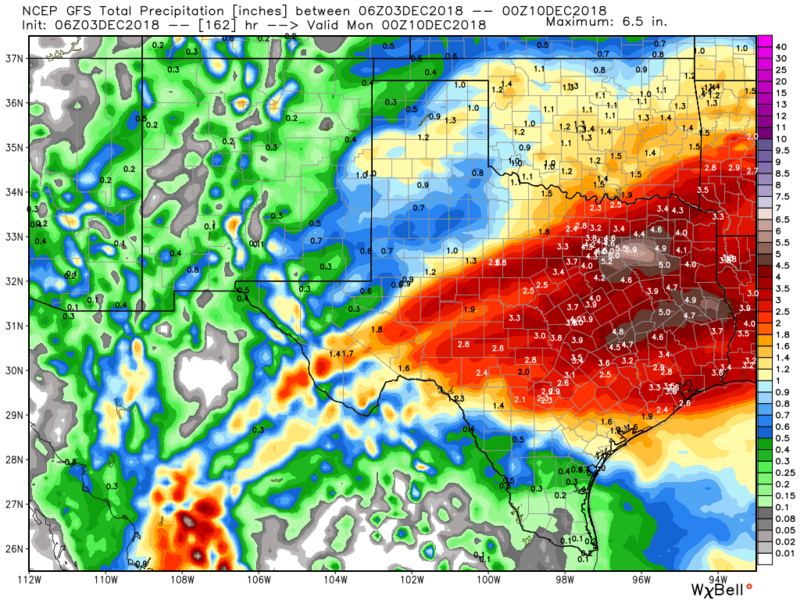 The bottom line is to be prepared for the potential of some heavy rainfall heading into this weekend, and to factor that into any plans you have. In the wake of the next front, the start of next week will be quite chilly, with a few days of highs in the 40s or 50s. Lows are likely to remain above freezing, but we can’t say so for sure for all of Houston. Winter, y’all. Not complaining at all! Beats the heck out of 90 and humid. A really nice day today, IMO. Where in Pearland is their weather station? On top of one of the pear trees? I don’t mind seeing that we had a dry and chilly November – after all, it is a nice change from the usual “hot and humid” that persists most of the year. If we’re planning to watch the Presidential Funeral Train go by on Thursday, do you think we need to plan for rain? If rain would annoy you and interrupt your plans, then yes, you should plan for rain. 😉 This answer is based strictly on Murphy’s Law. Not on the forecast. Eric pretty clearly said the beginning of his timing window is Friday. So Thursday is probably relatively safe. But he said the timing is uncertain. He also said the forecast for Thursday is windy. So waterproof windbreakers / raincoats seem like a good idea.